List of the complete news in EYP Georgia as well as important events throughout Europe. Do you see these focused EYPers who are sunk in thoughts, contemplating on something extremely important? Do you want to feel the same significance and pleasure, which comes only thrugh working at EYP sessions? Then this post is just right for you! We are thrilled to remind you that the call for the Vice-Presidents, Chairpersons, and Editor(s) is still open. You can join the session as an official and make a huge contribution to the efficiency and productivity of its other participants. If you think you can accept the challenges of Tbilisi 2017, then hesitate no more! Apply as an official and join this ground-breaking event, which will, for indeed, leave a revolutionary trail on EYP history. You can apply through the Members’ Platform of the EYP. This entry was posted in News, Tbilisi 2017 on August 15, 2017 by Gega Darakhvelidze. 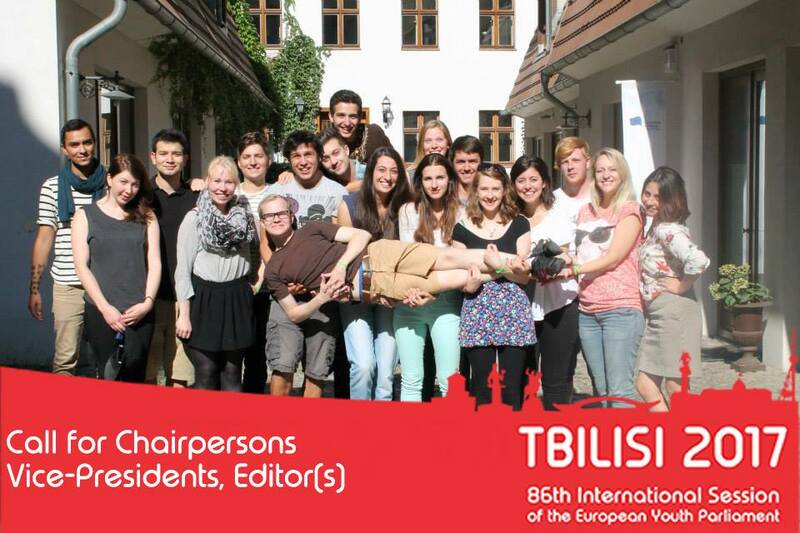 With the #EYPThrowback to the Chairs Academic Training of Tbilisi 2013 – 74th International of the European Youth Parliament, which took place at the International Office of the network in Berlin, we would like to launch the call for Chairpersons, Vice-Presidents and the Editor(s) of Tbilisi 2017! You now have the opportunity to join the International Team of Officials and contribute to the success of the flagship event of the EYP taking place in November. Join the session President Valentina Mina as well as the Head-Organisers Zura Giorgobiani and Tamta Tsveraidze to make the 86th International Session of the European Youth Parliament (EYP)an unforgettable experience for almost 250 youngsters from all over Europe. We are looking forward to receiving and reading your applications! This entry was posted in EYP30, News, Tbilisi 2017 and tagged #EYP30, #EYPthrowback, Call on August 9, 2017 by Gega Darakhvelidze. Here comes the moment we all have been waiting for a long time! It is our utmost pleasure to announce Ms. Valentina Mina (CY) as the President of Tbilisi 2017! We are extremely proud to have such a dedicated alumna and an experienced EYPer as a head of the chairs team. Due to her indispensable skills and comprehensive knowledge, it is rational to say, that academic part of the session is in safe hands. 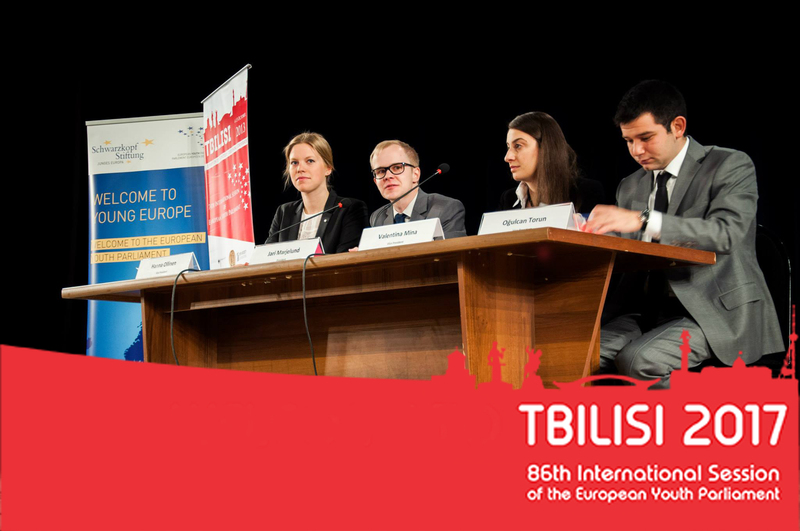 Ms. Valentina Mina headed the chairs team as one of the Vice Presidents of Tbilisi 2013- 74th International Session of European Youth Parliament. Hence, her experience is boundless and her opportunities to make Tbilisi 2017 unforgettable is infinite. With the President of the Session being announced, stay tuned for the further calls. Do not miss the chance to join the event of the year! This entry was posted in News, Tbilisi 2017 on August 5, 2017 by Gega Darakhvelidze. Who is the Board of the Session? Apart from the Head Organisers- Tamta and Zurab- whom you are already very familiar with, and who are leading the team of dedicated organsiers, there is another team, which is ensuring the academic standards of the session meet the criteria set by the International Office of European Youth Parliament. At each session, the Chairs team, which serve as team leaders in the committees, is there to excel the expectations of making the session educational and informative as well as guarantee the delegates are getting the best out of the experience. The Chairs’ team is led by the Board, which is consisted of a President and two or three Vice Presidents. They are the ones, who work on the Session Theme, come up with the final versions of the Committee Topics and facilitate the job of the Chairpersons. Tbilisi 2017 is thrilled to have a President, who has already been in Georgia before and probably has already tried a throne of the board at the previous International Session held in Tbilisi in 2013. Are you already intrigued enough? Are you curious who the President of this flagship event of 2017 is? Stay tuned and check our Facebook page regularly, as we will announce the President of Tbilisi 2017 in just a few hours! This entry was posted in News, Tbilisi 2017 on August 3, 2017 by Gega Darakhvelidze. We are extremely proud of the alumni who have represented our National Committee at International Sessions as officials. Ms. Ia tserodze was one of the International Chairpersons at Leipzig 2015- 80th International Session of European Youth Parliament. 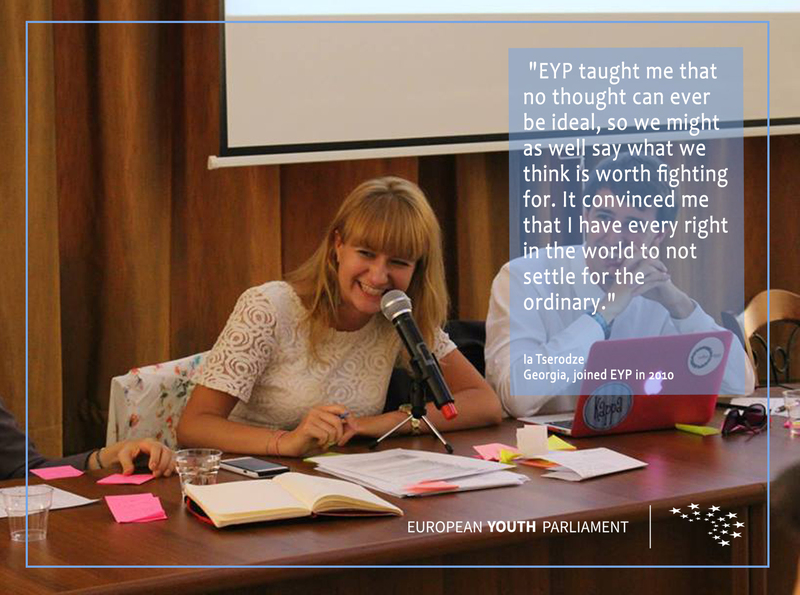 Her inspiring point of view about EYP is, for indeed, worth reading. “ EYP taught me that no thought can ever be ideal, so we might as well say what we think is worth fighting for. EYP, to me, is not about change — it’s about expansion. It did not change my vision, but taught me how to be assertive and confident in it. EYP formed my dreams into lucid, attainable goal. It taught me how to cherish my European values, but also showed me how core values are not necessarily European, but human. It taught me how to turn an impasse into an asset. It taught me that it is better to fail at originality than succeed at imitation. This entry was posted in EYP30, News, Tbilisi 2017 and tagged #EYP30, #EYPimpact on July 23, 2017 by Gega Darakhvelidze. 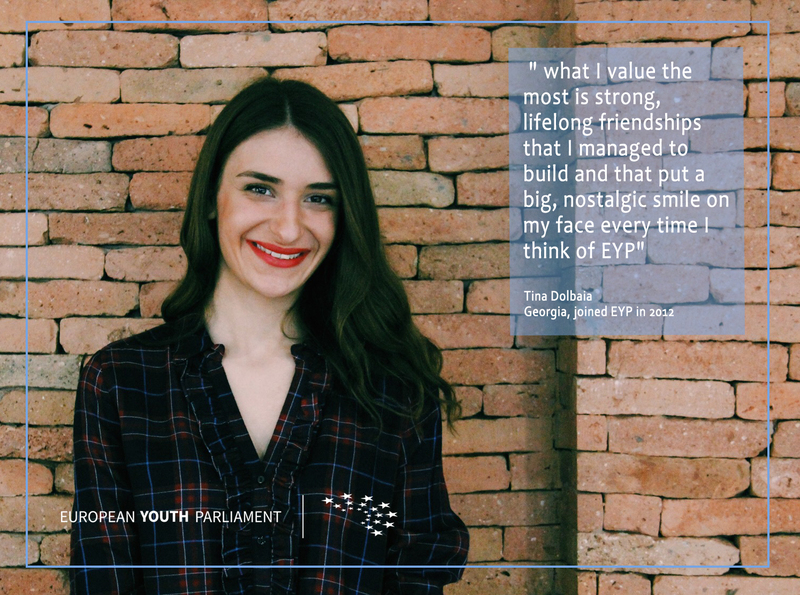 The landmark series of Georgian #EYPimpact continues with Ms. Tina Dolbaia who served as the Vice President of EYP Georgia and led the team of Human Resources in 2015-16. Check out how she shares her “rewarding addiction” to EYP with us! #EYPimpact is all about what alumni absorb from being a part of the organisation, which changes lives in different ways. 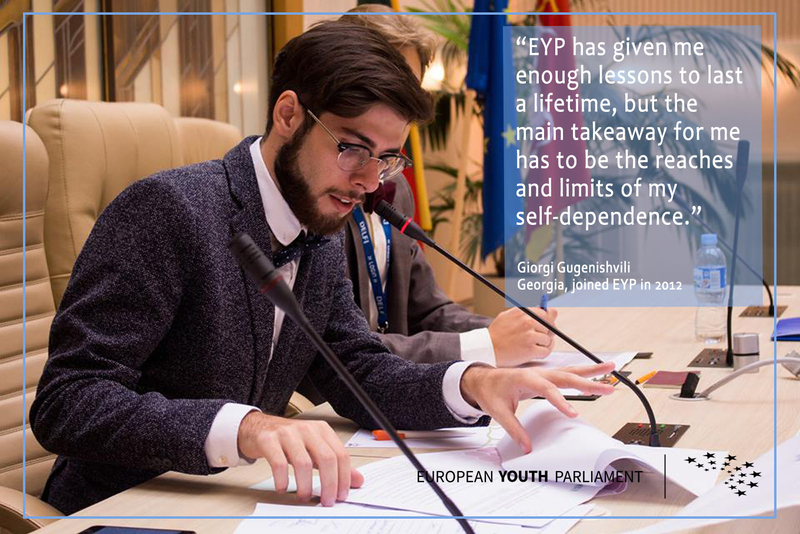 Mr. Giorgi Gugenishvili, who was a board member of EYP Georgia in 2014-15, talks how EYP builds individual worth and at the same time develops skills to work in groups. He also explains how these two great values secure each other’s success altogether.